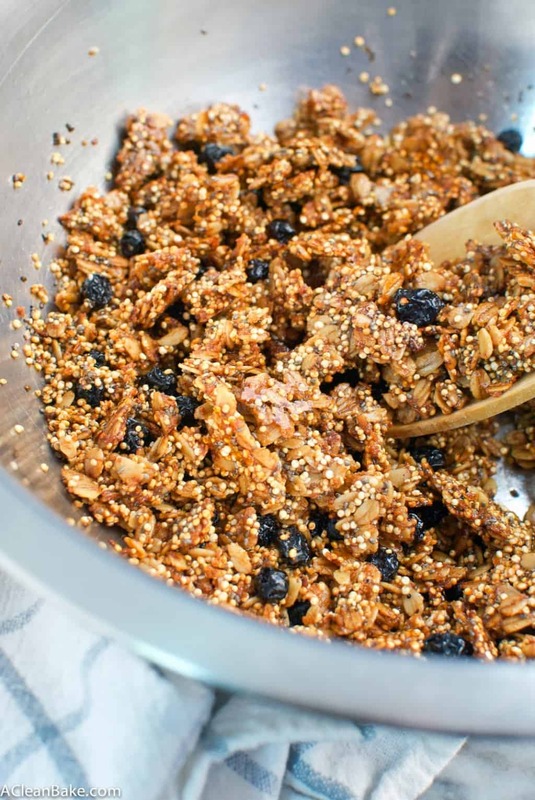 This blueberry chia quinoa granola is a crunchy sweet breakfast that is so easy to make! It’s tasty, healthy, & high protein. The whole family will love it! The funniest thing about food trends is how dramatically they are reversed some time later. Remember in the ’80s when fat was THE ENEMY and low-fat everything was THE SECRET to weight loss and longevity, or at least being able to pull off a super-high-legged leotard without making your thighs look, like, totes massive? Oh, how the tides have turned. 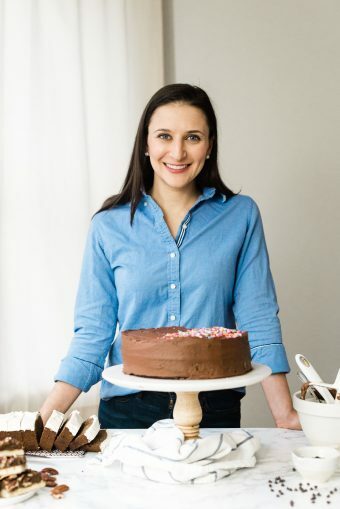 Most of the fashionable diets that have emerged in the last few years (like Paleo, etc) villify carbs and pile on the fats, which are heralded as THE SECRET to weight loss and longevity, or at least being able to get through your crossfit workout without totes passing out? Sidenote: I don’t know about you, but I’m pretty sure that no matter what I ate and in what quantities, I would still almost certainly pass out if I tried crossfit. Preheat the oven to 325F. Cover a large cookie sheet with tinfoil and spray with a layer of cooking spray. n a large mixing bowl, stir together the dry ingredients (oats, quinoa, chia seeds, coconut, cinnamon and salt). In a small mixing bowl, stir together coconut oil, honey and vanilla. Warm slightly by microwaving for 10-20 seconds to melt the oil and honey, making it easier to stir, if necessary. Pour wet ingredients into dry until everything is evenly mixed and coated. 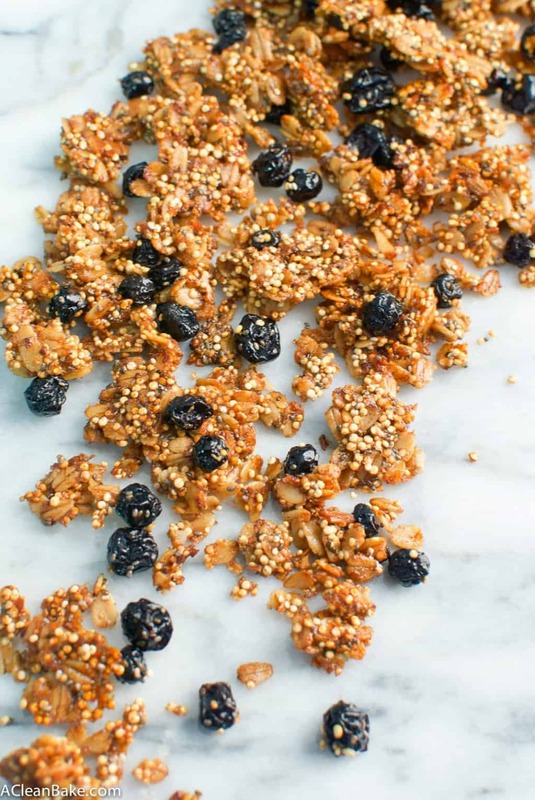 Turn granola out onto prepared cookie sheet and press together into one thick layer in the center of the sheet. Try to make the layer as even in thickness as possible to prevent some parts burning before others are cooked. Bake 10 minutes before turning the temperature down to 250 and baking an additional 30 minutes. Crack oven door an inch or two (use the handle of a wooden spoon to brace it open if necessary) for 30 minutes, which will bring the oven temperature down slowly and dry out the granola to crisp it up. Carefully peel the granola off of the pan, breaking it gently between your fingers to leave some clumps in tact. Make sure it is completely cool before serving or storing in an airtight container at room temperature for up to 3 weeks. (1) If you want a little more sweetness, feel free to add an additional Tablespoon of honey. If you use unsweetened blueberries, you may want to add more sweetness. (2) You can cover your cookie sheet with a nonstick pad instead of tinfoil, but I find tinfoil is best for crisping foods in the oven.